Home / Issues / 2014 May/June / Opinion // Bans, Blacklists and Flyers, Oh My! As usual, the thought police are trying to silence diversity of opinion about Israel. 1. Recently, a stranger came up to me at a meeting and accused me of “destroying the Jewish people” because I had signed an open letter to New York’s Mayor Bill de Blasio faulting him for secretly meeting with the American Israel Public Affairs Committee (AIPAC) and virtually declaring himself its lackey. The mayor never responded to our letter. But the Jewish attack dogs came out in force. Several of the letter’s signatories (I will not compound their distress by identifying them) were reprimanded by wealthy donors and board members who made clear that criticism of AIPAC will not be tolerated. There were lightly veiled intimations that they might find themselves without a platform or their institutions suddenly starved of funds. An anonymous flyer distributed at Congregation B’nai Jeshurun accused two of its rabbis, who had signed the letter, of making “false and defamatory statements” about AIPAC and committing the sins of lashon hara [evil gossip] and hotzaat shem ra [libel].” A group of conservatives, including Jeffrey Wiesenfeld, a former aide to leading New York Republicans, took out an ad in New York-area Jewish media comparing the 58 signers to Jews who, in 1943, urged FDR not to meet with European rabbis pleading with him to save European Jews. Such public vilification is meant to force Jewish leaders to either censor their beliefs or risk being labeled treif and kicked out of the tent altogether. 2. One group that many Jews want to keep out is J Street, the oft-defamed pro-peace, pro-Israel lobby founded six years ago as an alternative to AIPAC. The latest kick below the belt is a film, The J Street Challenge, produced by the right-wing group Americans for Peace and Tolerance (APT). The film suggests that J Street hoodwinks gullible naifs, sells peace like Kool-Aid and, through its “seduction” of the innocents, imperils Israeli security. Though it promises to show “both sides,” its clear intent is to demonize J Street. The film features well-known J Street detractors whose views on Israel range roughly from A to B: for instance, Harvard professors Alan Dershowitz and Ruth Wisse, Rabbi Daniel Gordis and Wall Street Journal columnist Bret Stephens. It characterizes J Street supporters as narcissistic lefties who “can avoid the pain of feeling disloyal to their own people [emphasis added] and at the same time can enjoy the benefits of their progressive bona fides.” APT’s president, Charles Jacobs, says J Street “undermines” real pro-Israel groups. 3. New York’s Celebrate Israel parade routinely attracts about 30,000 participants and hundreds of thousands of spectators. To march in the 50th annual parade on June 1, groups had to sign a statement that they “identify with Israel as a Jewish and democratic state” and will not carry banners that are “political, divisive, or inflammatory.” For some critics, this wasn’t enough. 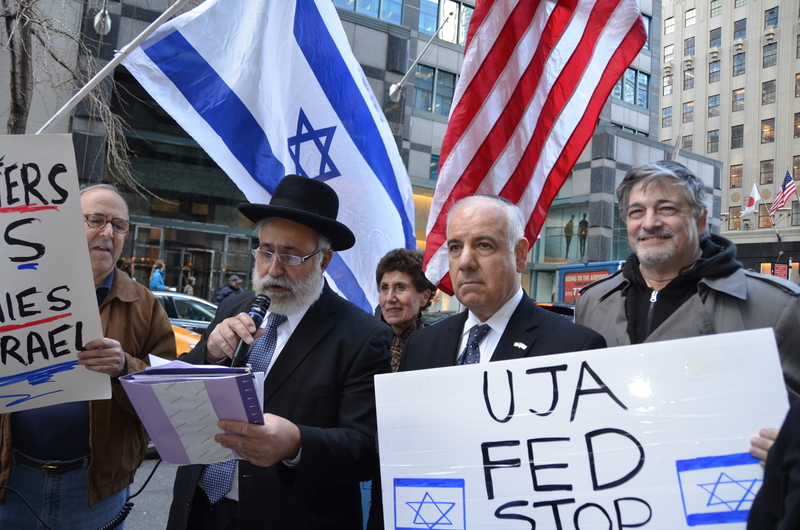 The Zionist Organization of America, Americans for a Safe Israel, JCC Watch, American Friends of Likud and Rabbi Elie Abadie of Manhattan’s Safra Synagogue accused the parade’s sponsors—UJA-Federation of New York and the New York Jewish Community Relations Council—of permitting the participation of groups that support BDS (boycott, divestment and sanctions against Israel). JCC Watch circulated a flyer equating certain Jewish groups with Nazi storm troopers; one rabbi likened the sponsors to appeasers of the Nazis. Rabbi Abadie, ostensibly representing his shul and three other Sephardi groups, threatened that his contingent will pull its people and financial support unless the sponsors “disqualify” certain “enemies of the state of Israel” from marching. Who are these “enemies?”: The New Israel Fund, which funds Israeli democracy projects; B’Tselem, an Israeli human rights group; and Partners for Progressive Israel, which supports Meretz, an Israeli political party that currently holds six Knesset seats. Letty Cottin Pogrebin is at work on her eleventh book, SJM Seeking Soulmate, a novel. explains MS magazine’s editorial policies, incl. paeans to Alice Walker, etc. The question is: Who are the actual saboteurs -whether knowingly so or not? Letty Cottin Pogrebin likes to toss around inflammatory words. A few years ago she used the word “apartheid” to describe Israel’s security barrier. Now it’s “McCarthyism”. McCarthyism, remember, was about firing people from their jobs and throwing them in jail. It was not so concerned with who gets to participate in which parades. The worst thing a Jew could be is a Jew that doesn’t support Israel and yes that includes the Israeli government. What people have to understand is that regardless if the government was right or left wing nothing would change. Settlements will still be built, which by the way were recently thwarted by Bibi as well as a law that would ban Jews and Palestinians from riding the bus together in the West Bank. People that don’t live in Israel will always be naive. Even the left in Israel and there many many left wing people that live here believe that the Palestinians are a threat to themselves and to the Israeli people.